Lincoln is easily the most compelling film about the legislative process ever put to celluloid. Master filmmaker Steven Spielberg has assembled his own Team of Rivals (partially based on the Doris Kearns Goodwill book) for a historical biography of the sixteenth President of the United States through the lens of passing the Thirteenth Amendment to abolish slavery. 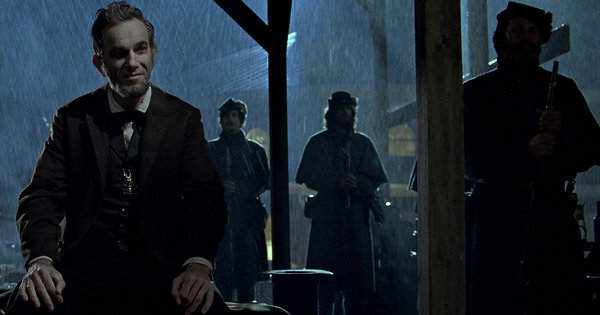 Little needs to be said about Daniel Day-Lewis' powerful performance as Lincoln. It is an understated, effective, and wholly convincing portrayal. Lincoln is an intimate, cinematic portrait of man going through a period of great historical significance in the context of his own struggles. He is shown as a logical, reasonable man fighting to succeed in his duties, maintain his marriage, persuade a combative congress to end slavery, lead a fractured nation, and end the Civil War. Tony Kushner's (Munich) script articulates the political nature of the time well and fluidly. Spielberg sheds his usual sentimentality and romanticism for a more straightforward, humanistic approach. Kushner takes Lincoln out of his own mythology, and through Day-Lewis' performance, conceptualizes him a real man with everyday problems as well as the weight of a nation divided on his shoulders. Lincoln's speeches in the film feel more humorous and personable than historic. Never have we seen such an intimate look at the man known mostly as a heroic figure, many years later. Spielberg has assembled a treasure chest of character actors as historical political figures. Tommy Lee Jones steals most scenes he's in as radical Republican abolitionist Thaddeus Stevens. His cranky bursts of idealism capture the zeal for the abolishment of slavery well. Unfortunately, Joseph Gordon-Levitt is wasted as Lincoln's son Robert Todd. His father-son storyline is rather shoehorned in and feels like a symptom of Spielberg's own thematic tendencies. Sally Field is sympathetic as the unbalanced, overly emotional wife and first lady Mary Todd (aka Molly). Lincoln is a splendid exploration of the president's humanity and political genius. It wisely frames the film, not only historically, but with personality and humour. Day-Lewis' performance acts a great anchor for the event with him standing tall. Lincoln is a great dramatization of more than history but the legislative process and government at work.